Sniper Man: Hit First 3D - Hold your breath & Pull the sniper trigger in this real-life 3D graphics and sounds environment, the game gives an exhilarating experience to complete this mission. Use your limited ammo wisely and kill the insane enemies at a distance before they get a chance to aim at you. Aim for head-shot to preserve your ammo. The enemy isn't aware of your presence so take your first shot carefully, to begin the onslaught, because the moment you fire, your gunshot will be heard and the enemy will be upon you before you know it. There’s no turning back, so let the onslaught begin. Make sure you keep yourself well focused and determined before firing your first shot. Wish you all the good luck that you would surely need for this mission. 1. Touch and move the screen to aim the enemy. 2. The enemy will not attack with their Ak-47, until you fire your first shot. 3. Use your Sniper scope to aim at enemies from a distance. 4. Use fire button to shoot. 5. Aim for the head; shoot once and accurately, to stay away from their onslaught. 6. The gun reloads automatically. 7. Zoom in to kill the enemy and then zoom out if required. 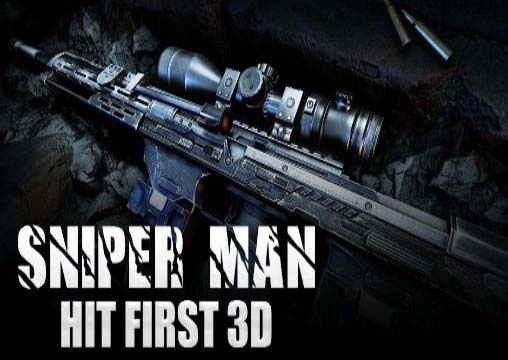 Sniper Man: Hit First 3D: install APK and play the game.